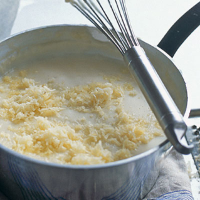 A mature Cheddar or nutty Gruyère will melt perfectly in this versatile sauce. Try it poured over broccoli or cauliflower that has been sautéed with pancetta and grilled until golden; or wrap some leeks in ham, smother with the sauce and cook in the oven till bubbling. You could also mix it with cubes of fish, add some capers and bake with sliced potatoes on top. Put the butter in a saucepan and melt until foaming. Stir in the flour and continue to cook and stir over a medium heat for 2 minutes; the roux should look just toasted. Off the heat, gradually beat in the warm milk, whisking until smooth. Return the pan to a medium heat and continue to cook, stirring, for 3 minutes, until it comes to the boil. Then reduce the heat slightly, and continue to cook, stirring, for 1 minute. The sauce should thickly coat the back of a wooden spoon. Take off the heat and let the sauce cool slightly; gradually add the cheese, stirring between each addition. Add the mustard and season.